The Burnaby Board of Trade is pleased to sign a memorandum of understanding with the Immigrant Employment Council of BC (IEC-BC) to help promote tools and resources available to our members to help with attraction, retention, integration and inclusion of immigrant and refugee talent and labour. 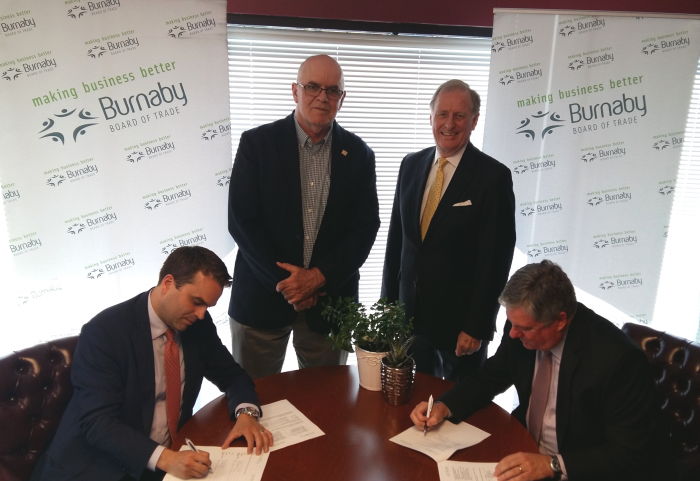 Labour shortages continue to be a major issue for local businesses, and this MOU will help the BBOT and IEBC partner on events, programs and outreach efforts to help Burnaby businesses access important information and resources on how newcomers to Canada can help provide much needed skills and talent. IECBC works towards the successful integration of skilled newcomers into the BC labour force, which is critical to both their success and the province’s long-term economic performance, and works with employers, government, and other partner stakeholders to ensure that BC employers can effectively integrate global talent.